The waist deep lagoon is the perfect training location. 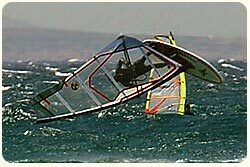 With the sandy seabed and with onshore wind, learning and practising is extremely safe and fun. Learning is easy with lessons in small groups and the added advantage of flat and shallow water. 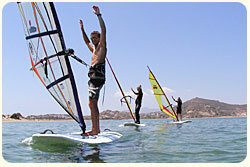 Instruction from Naxos-Surf Club covers all levels and personal needs. Our experienced surf instructors are VDWS and RYA certified and they will pass on their knowledge to you using the most modern technical support and training methods. Our personal touch ensures your fast progres! 6 hours (2h / day) course in groups of 4 people max. The fundamentals of windsurfing step-by-step. 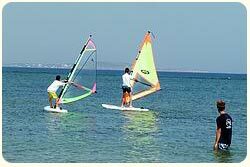 Starting, steering, tacking and beachstarting, introduction of harness and jibing. The course duration is minimum 3 days and is adapted on weather conditions.Special JP school gear and wetsuit included. All groups up to 4 persons max. per instructor. When the participants of the group are 2 persons, the duration of the course is being reduced to 4.5 hours. When only 1 person participates in course, the duration of the course is being reduced to 3 hours. 4 hours (2h / day) course in groups of 2 people max. 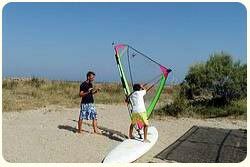 This course is aimed at those who have windsurfed before or completed a beginner’s course but have done a little windsurfing since. For refreshing the basics, beachstarting, fast tack, jibes and harness. Special JP School boards and wetsuits included. If only 1 person participates in course, the duration of the course is being reduced to 3 hours. 3 hours (1h / day) course in groups of 4 kids max. The 3 lessons tuition program for kids has the same content with the beginners course but in shorter duration. 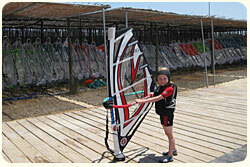 JP Young Gun boards and special kids sails included. Waterstarting is the main principal of this course, stance and planning in harness and footstraps is also part of this course. All you need to learn about the real carve jibe, sailing downwind and the correct stance is also part of the course. For those who need to refine and strengthen particular techniques and for anything else the learner wishes. From waterstarting and any kind of jibing up to freestyle moves.